Venezuela's government said on Sunday that six people had been detained over drone explosions at an event attended by President Nicolas Maduro as his political opposition warned of a possible crackdown after he accused his adversaries of seeking to assassinate him. Venezuela's government said on Sunday that six people had been detained over drone explosions at an event attended by President Nicolas Maduro, as his political opposition warned of a possible crackdown after he accused his adversaries of seeking to assassinate him. State television on Saturday evening showed the socialist leader appearing startled by what seemed to be an explosion while he was giving a speech in Caracas. Seconds later, the footage panned to hundreds of soldiers chaotically scurrying out of formation. Opposition critics said the government has in the past used such incidents as a pretext for heavy-handed actions against critics, including jailing some of the country's best-known leaders. "We warn that the government is taking advantage of this incident ... to criminalize those who legitimately and democratically oppose it and deepen the repression and systematic human rights violations," wrote the Broad Front opposition coalition in a statement published on Twitter. Bolivar Avenue of downtown Caracas, where the incident occurred, was calm Sunday morning. Joggers and cyclists were taking up two of the lanes that are traditionally used for weekend recreation. The stage where Maduro spoke had been removed. Two witnesses in the area said on Sunday that they heard and felt an explosion in the late afternoon, then saw a drone fall out of the sky and hit a nearby building. "I heard the first explosion. It was so strong that the buildings moved," said Mairum Gonzalez, 45, a pre-school teacher. "I went to the balcony and I saw the little plane … it hit the building and smoke started to come out." A second witness, who lives in the building that was struck by the drone but asked not to be identified, described a similar sequence of events. 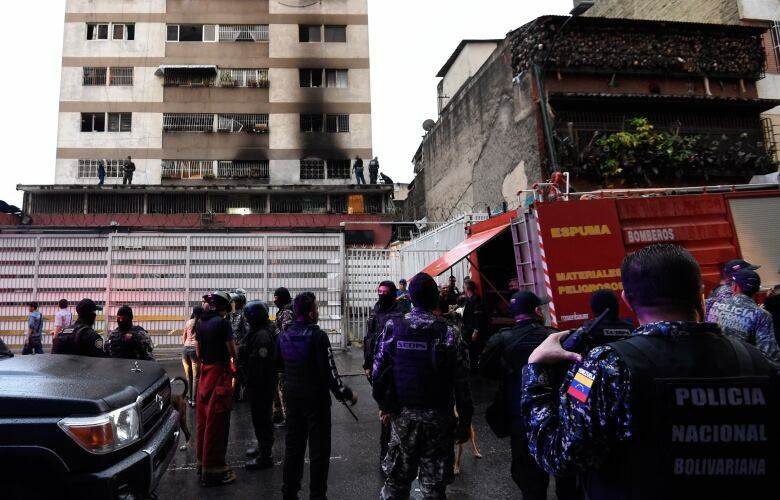 Firemen appeared quickly on the scene to put out the blaze, but were not told what the cause of it was, said Caracas fire department official Jose Oropeza. "The alarm was sounded at 5:40 and we went to the fire," said Oropeza. "It was a routine fire, that's all," he said. A shadowy and little-known group called the National Movement of Soldiers in T-Shirts, which claimed responsibility for the incident, sent a statement wishing a speedy recovery for seven wounded soldiers but vowed further resistance. Reuters was unable to independently confirm the involvement of the group, which in the past has said it is linked to anti-government street protesters known as "The Resistance." Maduro ally Freddy Bernal via Twitter sent mug shots of seven people who appeared to be in their early 20s, urging the Venezuelan people to search for "these traitors." Leopoldo Lopez, formerly mayor of Caracas's district of Chacao, for example, is under house arrest for his role in 2014 street protests that Maduro described as a coup attempt but his adversaries insisted were a form of free expression. Maduro's allies counter that the opposition has a history of involvement in military conspiracies, most notably in the 2002 coup that briefly toppled socialist leader Hugo Chavez. The OPEC member is struggling under the collapse of a once-prosperous socialist system — with millions now struggling to eat or find medicine — causing a growing exodus of citizens. "I have no doubt that everything points to the right, the Venezuelan ultra-right," Maduro said in a broadcast. "Maximum punishment! And there will be no forgiveness."